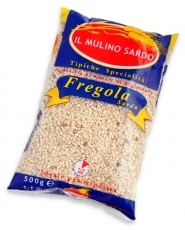 Fregola (also fregula) is a Sardinian type of pasta. It is similar to Israeli couscous. Fregola comes in varying sizes, but typically consists of semolina dough that has been rolled into balls 2-3 mm in diameter and toasted in an oven.